3 Simple Reasons Why Spain Is So Good! Make the Opponent Pick Their Poison! An offensive is good when the opponent is not able to solve it. An offensive is great when you great a problem for the opponent where every solution opens up another problem. Spain does exactly that. 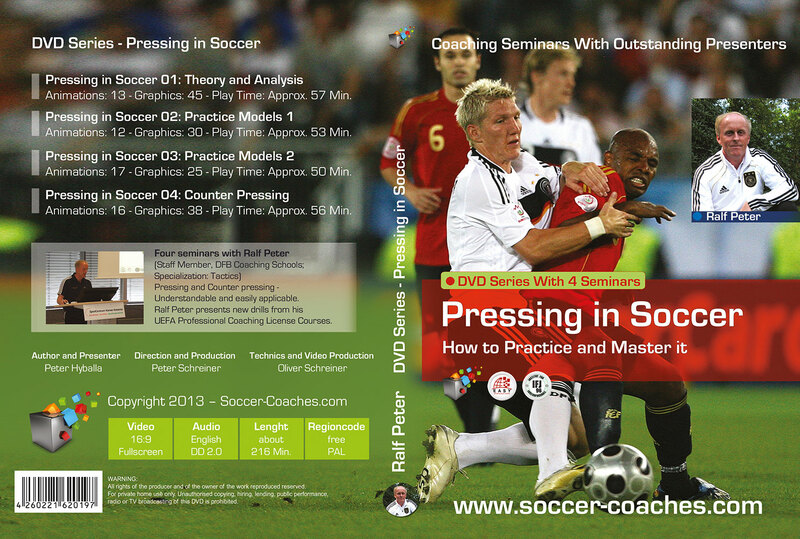 They create situations in which each defensive reaction reveals a space which is then used. Helpful for this is mainly the role of a traditional striker (instead of a ‘false 9’ – Morata), who adds more solutions to the game. Example 1: David Silva gets the ball due to a counterpressing situation near the box. Actually, Turkey already has great problem. 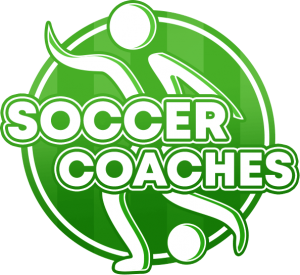 His direct opponent is too far away and must prevent a possible cross to Morata or shoot at the goal sprinting maximum speed. In addition, Silva has a short passing option to further continue the attack in the penalty area. Ultimately, Silva uses the movement of the defender for a short counter movement and dribbles himself into the box. 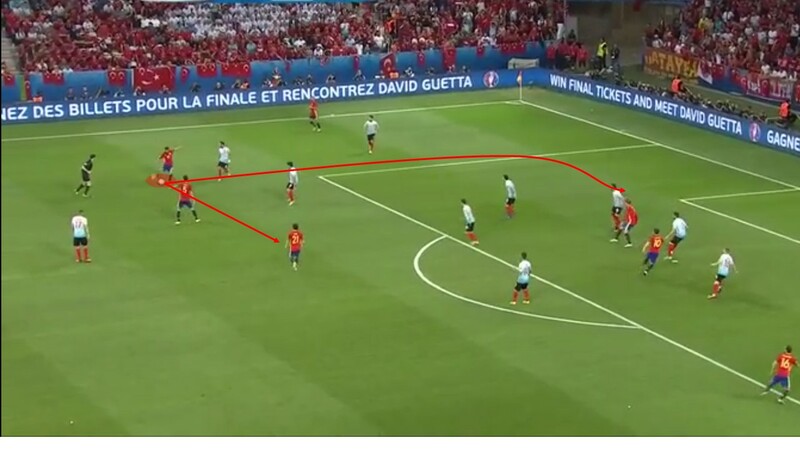 Example 2: The ball is again near the box – with more Turkish players being behind the ball, Spain has enough options. Firstly, Morata always offers the possibility to play a cross ball (of in this scene leads to the goal). Secondly, passing options are around the box. 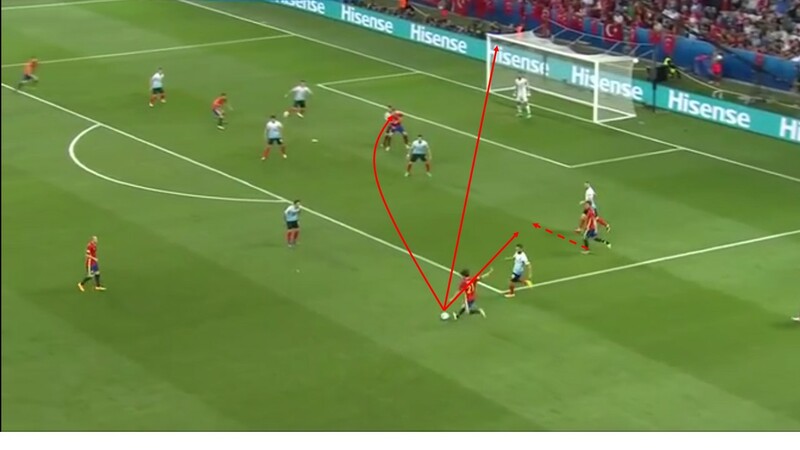 If David Silva as an example in possession Turkey must prevent a direct shoot or dribbling, which in turn would open passing lanes into the penalty area. Recognizing and Using Smallest Gaps! Another quality that Spain is executes almost to perfection is to recognize and use the smallest spaces. With this movement, the opponent can be overplayed directly or he is forced to adjust its position, which in turn will open other spaces. Example 1: Pique has dribbled the ball up in the right half-space. Juanfran recognizes the space the Turkish left-back revealed. 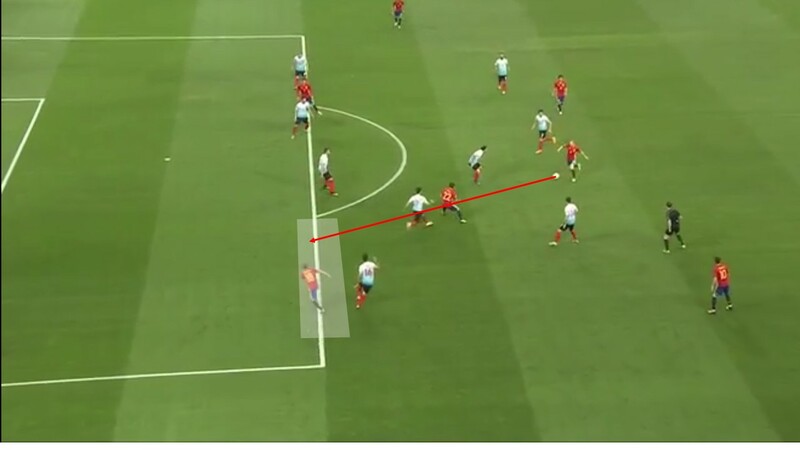 The situation on the ball (Pique is open and is not under pressure) allows a direct pass and is therefore realistic – that would force the defender to adjust his position. Instead he does not do it, and only one shoe length (offside) prevents a great chance to score. 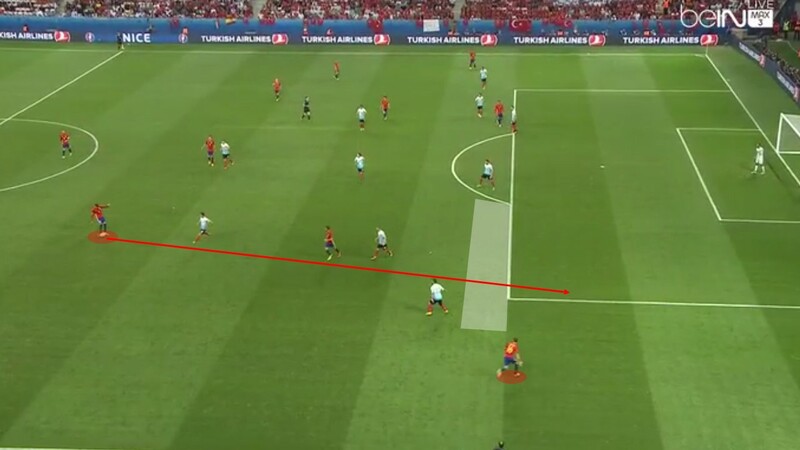 Example 2: Iniesta has the ball in the center and is not under direct pressure (which is basically already a problem in itself – see last paragraph). Nolito plays between the lines and thus pulls an opponent from away from the defensive line. Alba recognizes the space at the penalty area and runs in it. What follows is an incredible pass by Iniesta with the following 3: 0. Speaking of Iniesta. Nobody embodies the Spanish game as good as Iniesta. He is the manifestation of the best solution in every situation. Regardless of its almost magical skills at dribbling and passing game you never feel there would be a better solution to the current situation, than the one Iniesta finds. 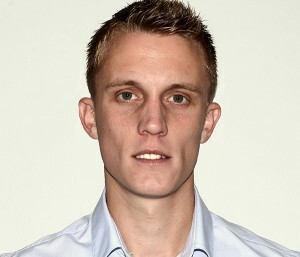 Good for Spain, he presents in time for the European Championship in absolute world class form. Conclusion: If anyone forgot about Spain ahead of the tournament they were reminded of what Spain is capable of.